An overdenture is a removable bridge designed for patients who have experienced a great deal of bone loss, usually due to gum disease resulting in missing and loose teeth. An esthetically pleasing bridge can be made by reducing the top portions of the remaining teeth and covering the root structure with individual restorations. These teeth, in turn, are covered by a removable plastic appliance—the overdenture—which they help support. Although this is a more expensive treatment than a conventional full denture, it provides a much stronger biting surface and considerable control over esthetics. If you have lost most of your teeth and are thinking about having the rest extracted and obtaining a full denture, consider an overdenture. Even saving just a few good roots can make a big difference in the way you chew. Treatment Time Four to eight weeks. Patient Maintenance Requires daily cleaning and periodic adjustments. Results of Treatment Hides the fact you are wearing a removable bridge. Average Range of Treatment Life Expectancy Five to ten years. One of the primary advantages of the full denture is its ability to maintain or even recreate lip and cheek support. Without this support, facial tissue sinks in, giving an aged look. Esthetically, however, the full denture is a mixed blessing. On the one hand, it allows the dentist to change almost anything you want in your smile. On the other hand, after you lose your teeth the normal "landmarks" are gone—and so is the memory of how the teeth used to look. Be patient and work with a dentist who is willing to help you obtain the smile you desire. Also remember that dentures wear just as natural teeth do. If you want to keep your facial support in tone, your dentures will eventually need to be relined or remade. Treatment Time Two to four weeks. Patient Maintenance Cleaning after meals to remove and prevent stains on denture. Results of Treatment Esthetically pleasing results are possible. Average Range of Treatment Life Expectancy Five to ten years. Tooth fracture may occur, and the need for relining may be necessary during this time. 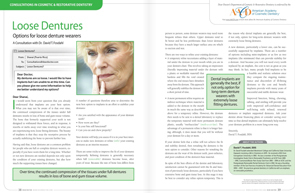 It was long thought that removable partial dentures had to be rigid to be effective. The innovation of the Valplast® flexible partial denture allows the appliance to adapt to the constant movement and flexibility in your mouth. The preparation is relatively simple as your natural teeth don't need to be altered. The Valplast® flexible partial denture is virtually invisible, no telltale metal clasps and the material itself blends with the tissue in your mouth so that the only thing that shows is your beautiful smile. If you can't bear the thought of visible metal clasps then a Valplast®flexible partial denture is an option. It looks very natural, and is designed to stay beautiful and comfortable for a long period of time. When considering a removable partial denture, many people find the Valplast® flexible partial denture to be the most comfortable option. It is metal free, does not require any preparation of natural teeth, does not contain the chemicals found in normal plastic dentures and is hypo-allergenic. 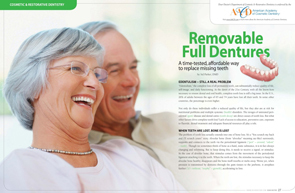 Your ultimate comfort is one of the most important considerations when restoring your missing teeth. Valplast®flexible partial dentures are designed to function within a flexible environment, to provide a high degree of comfort whilst being as unobtrusive as possible yet be strong without being rigid. Each and every Valplast® flexible partial denture is guaranteed* for life against breakage or fracture.